The WH6 iron / hydrogen sulfide reduction filter contains a combination of KDF85 media and coconut shell activated carbon. 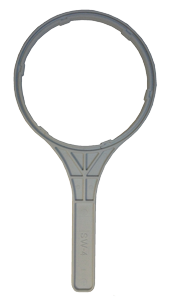 The KDF-85 effectively reduces dissolved iron and hydrogen sulfide odor over a wider pH range than possible with standard oxidation filters such as manganese greensand, thereby protecting your plumbing system including toilets, bath tubs and showers, and appliances such as clothes washers and dishwashers, from unsightly staining and odor. The activated carbon removes organic contaminants to substantially improve water clarity, taste, and odor. It does NOT add any harmful chemicals to the water, making it completely safe for drinking water applications. easy to replace cartridge - no media regeneration necessary and no backwash required! small size (only about 8 inches by 24 inches!) - save valuable floor space! filter features built-in granular activated carbon post-filter for the removal of a wide range of organic contaminants and better tasting water. KDF85 media acts as a catalyst to change soluble iron (ferrous) cations into insoluble ferric hydroxide which becomes trapped in the filter. The hydrogen sulfide is converted into an insoluble sulfide precipitate which is then similarly trapped and filtered. Ferric iron is removed by mechanical filtration. This system should be employed where low to moderate ferrous (dissolved) iron or hydrogen sulfide contamination is known or expected (hydrogen sulfide produces a distinct rotten egg / sulfur odor). 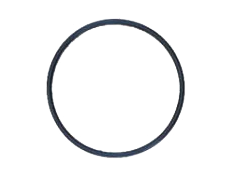 This filter is most effective where iron and hydrogen sulfide levels are less than 3 ppm. Best contaminant removal rates are achieved where the pH is between 6.5 and 8.5 and where the water contains some dissolved oxygen. 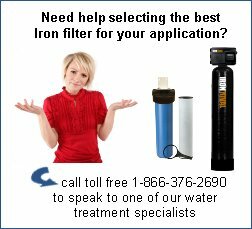 This filter will also remove ferric iron through mechanical filtration, although a sediment filter may be a more cost effective choice. 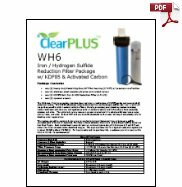 If your pH level is 7.0 or higher, you should consider our WH5 Series iron / hydrogen sulfide reduction filters which use a different filter media (the replacement cartridges are significantly cheaper). The life of the filter cartridge depends on the contamination level (iron, manganese and hydrogen sulfide levels) and amount of water consumed on a daily basis. The expected filter life for a typical residential application is about 20,000 gallons (75,500 L). For best results and longest filter life, a sediment pre-filter is recommended. Not recommended where pH level is less than 6.5 without prior pH correction. Suitable reduction of low levels of manganese can often be achieved where the pH level is greater than 8.0 and less than 8.5, and where the manganese level is a minimum of 5x higher than the iron level. For most manganese removal applications, we recommend our Iron Rival Series of Backwashable Iron Filters with Filox media. This filter should be installed on the main cold water line after the pressure tank or water meter. Which contaminant are you dealing with?